I’ve been wanting to share this post for so long now. With the baby almost here, we have been finally organizing and completing many parts of the house in anticipation of the fact that we might not have as much time once he arrives. I finally carved out some time to photograph our home kitchen renovation and share it with you all! Our kitchen was definitely our biggest project after we bought our home in 2017. I can’t believe we have been living here for almost 2 years! When we saw the home, we loved the single story style, large backyard and minimal feel of the entire home. The home was move-in ready and was very well-maintained by the previous owners. The only parts of the home that we felt needed some updating was the kitchen and master bathroom (see previous post on our master bathroom remodel). The kitchen was small compared to the rest of the house and it had weird cutouts in the walls to connect the dining room and living room. Plus the cabinets and floor were just not my style. I knew immediately that we had to renovate the kitchen if we bought this house. We saw so much potential in the house and soon after, made it our home! BLACK FRIDAY SALES are in full swing! Yesterday I shared some of my favorite Black Friday Clothing Sales and today I wanted to share some of my favorite Black Friday Home Sales! So lets get to it! We finished up our home renovations at the end of November! It was a 4.5 month process where we lived in construction, without a kitchen and poured over every design detail. We hired a good friend’s dad as our general contractor but designed and picked out everything ourselves. This was a learning but rewarding experience. It costed and took a bit longer than we wanted but we are incredibly happy with how everything turned out and happy to finally feel “at home”. I will be doing a separate post on our home renovations shortly with some fun before and after photos. Although we are done with the renovations, the fun decorating (a.k.a. Joanna Gaines) part has just begun and I’m hoping to carve out some time to get everything done! A few months ago we bought a home and started renovating the kitchen and master bath immediately. The house was built in the 60’s and although move-in ready, we wanted to update the kitchen and bath to more of our style. After living in construction for 5 months, we are finally DONE with renovations! All that’s left to do is my favorite part – get my Joanna Gaines on :). That process in itself will take a while as we have been overwhelmed with opening our new store and of course our IVF journey. We kept most of our furniture from our condo but we’ve been wanting to try out a new mattress. With all of the work and stress we put our bodies through, we realize now more than ever the importance of a good night’s sleep and a good mattress. I’m obsessed with buying pretty decor pieces for our home and office so naturally when I think of gifts for others, I love thinking of items that they can use but that are lovely at the same time! I gathered some of my favorite home decor pieces that make me feel great whenever I see them, but also keep me organized and my home pretty. See more of my favorite gifts for the home below, and these are all under $100! The hubs and I have been busy decorating our new home (woohoo!). It’s our first time as homeowners (we feel so grown up) and unfortunately for the hubs I have fallen in love with almost everything from Target’s home decor section. 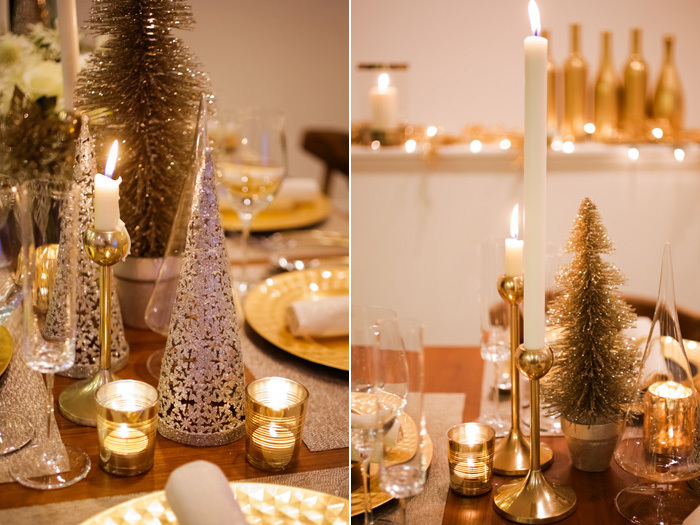 They have so many affordable and stylish pieces in my favorite mix of glam, gold and neutrals. I tell the hubby “at least it’s not pink, fluffy and lacey?”. And “at least I’m not spending it on shoes…yet…” I think he’s learned the term “happy wife, happy life” =). I may have purchased some or all of these items =P – click on the photos below to find out more details on each piece! And don’t forget the Target RedCard gets you FREE SHIPPING and 5% off your order! Just remember to monitor your credit card activity for any suspicious transactions =). Can’t wait to share photos of finished rooms…we just have to finish them first! LOL! 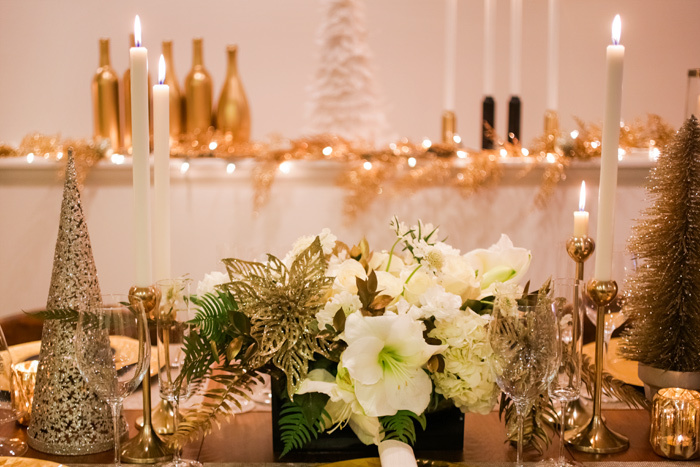 The beautiful holiday floral arrangement we created was the perfect centerpiece for our table setting and now here’s the complete look. 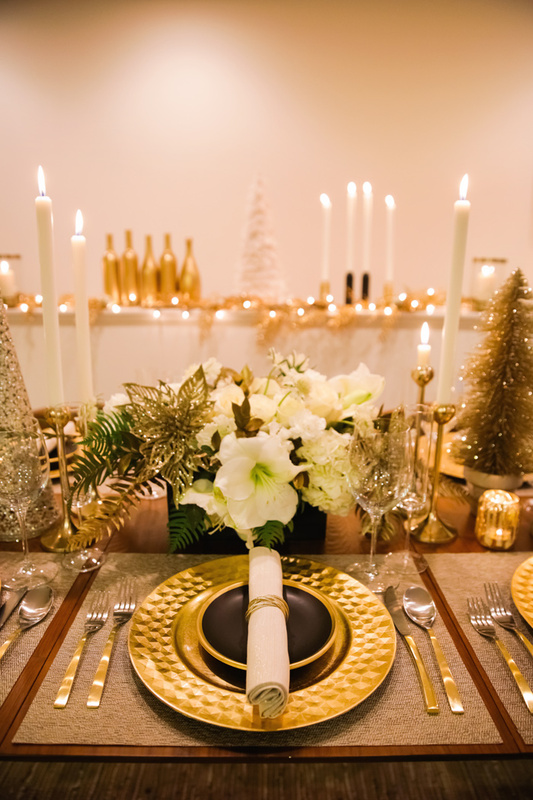 We added candles, linens and other gold accents to create a gorgeous holiday look. Almost everything on the table was purchased from Target or Crate and Barrel, two places I shop at way too much (just ask the hubs). One of my favorite things about our setup was a DIY project by the husband! 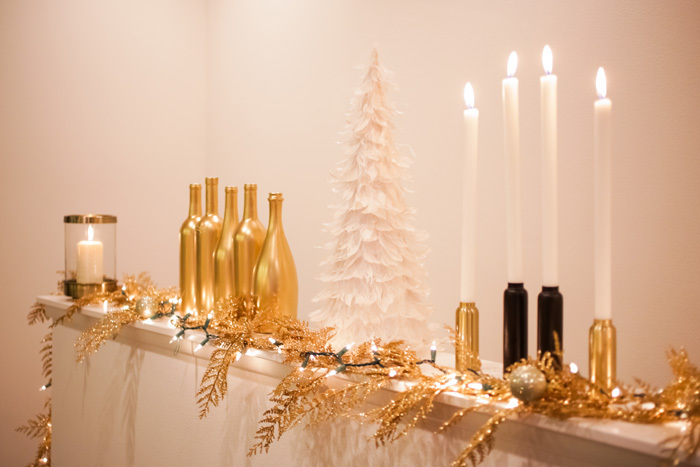 He knows how much I love gold and spray painted some used wine bottles to fit the theme. Yesterday we hosted a small holiday party for some of our closest friends. 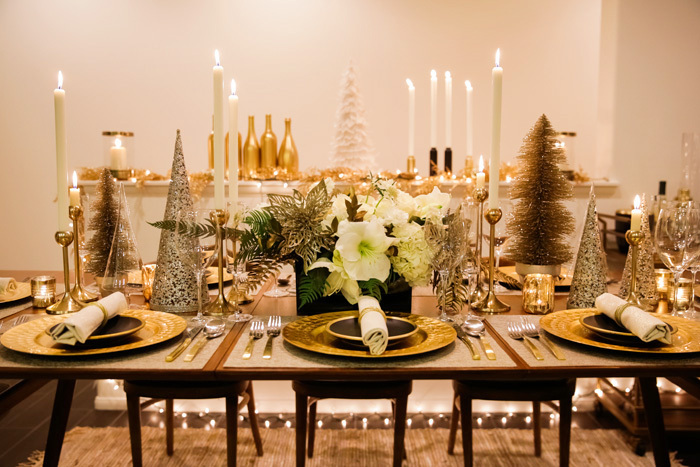 With the help of my florist friend, Helen, we created a gorgeous golden holiday table setting. 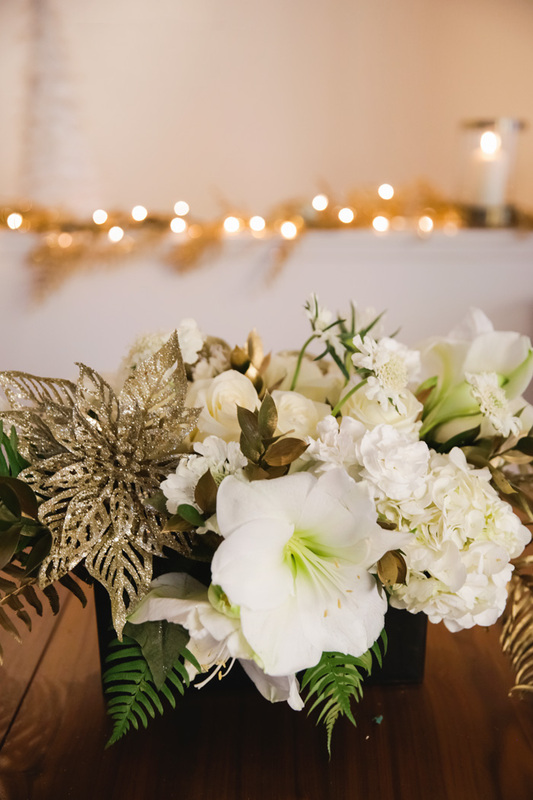 Here Helen shows us an easy guide on how to create a beautiful holiday floral arrangement. 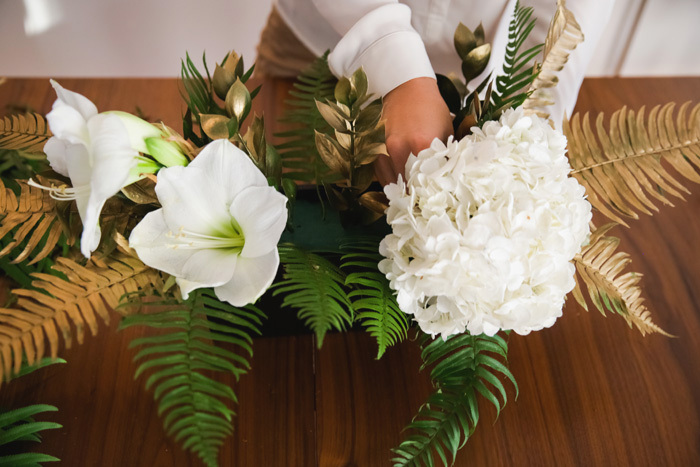 Paint the Brake Fern and Ruscus gold to add some color to your arrangement. It is usually better to paint the greens rather than the flowers themselves. Cut the floral foam to fit the size of the container. The foam should be sticking out the top for about an inch. 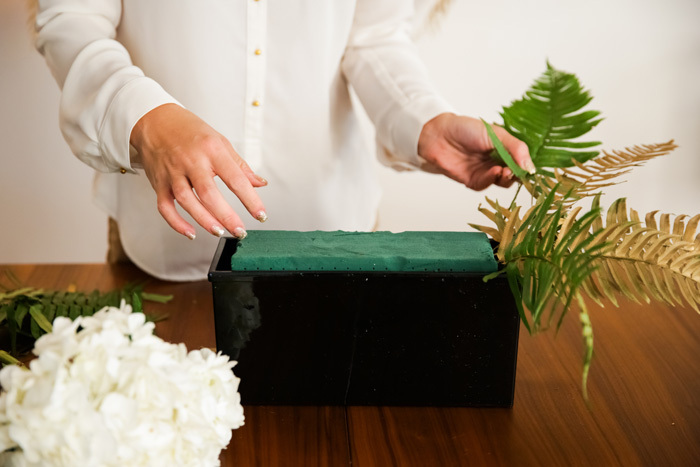 If you have a large container, you can bevel the edges of your foam to use less flowers. Soak your floral foam in a bucket of water for a few minutes. Add the Brake Fern and Ruscus into your arrangements. Put them against the lip of the container to hide it as well as in the center to break up the flowers a bit. Save some of the greens to add later, after you’ve added your main flowers. Modern arrangements do not need to be symmetrical. Add your larger flowers into the arrangement in places they can be noticed. If you have a “main” flower you want to focus on, make sure you put that front and center where it can get all the attention. We added some fake gold poinsettias to give our arrangement a holiday feel. 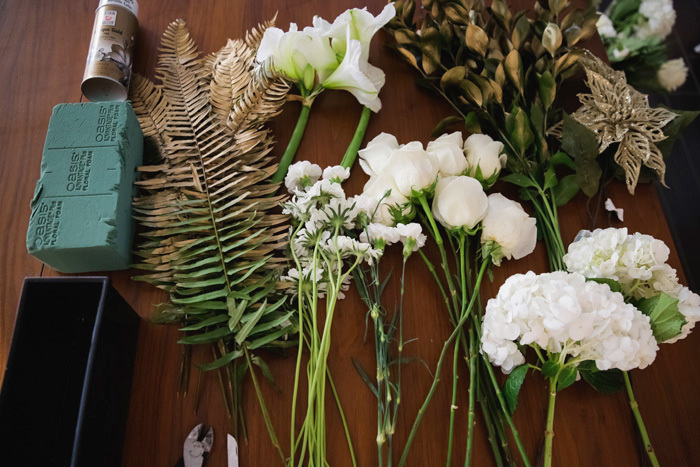 Flowers should be cut at an angle when placed in the floral foam. 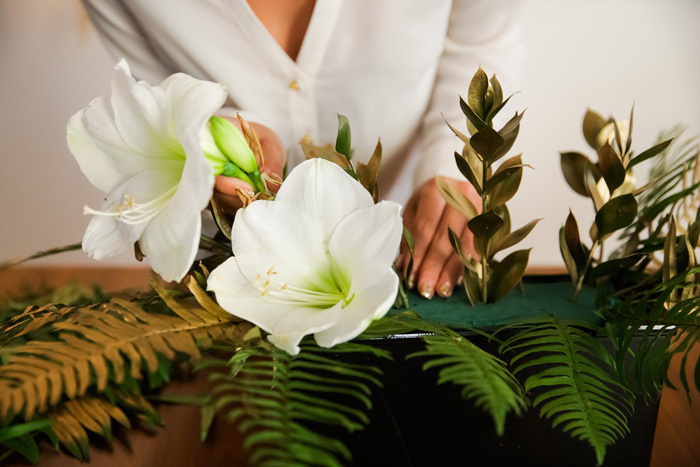 If you don’t like the placement of your flower, you can always remove it and try again – but remember not to put the flower in the same hole, otherwise it won’t be able to absorb water from the foam. Start to fill in any open areas your larger flowers left. Keep in mind that the flowers do not all need to be the same height. You can also add some more greens if you’d like at this point. The arrangement will last longer if you properly maintain it. As long as the floral foam has not dried out completely, you can add water to your vase for the foam to soak up. This will keep your flowers happy. 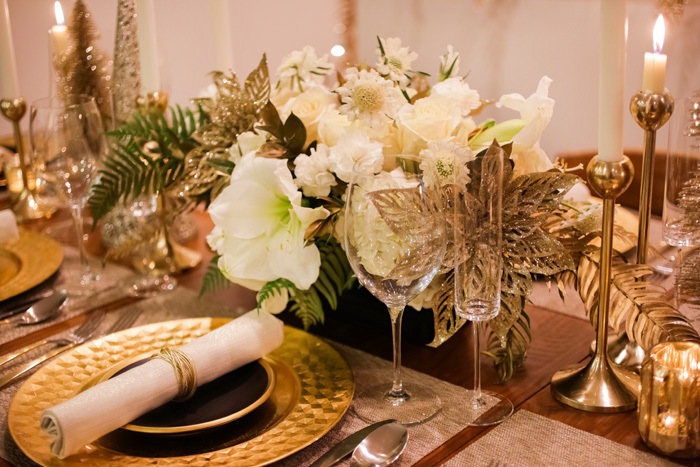 In a later blog post today, I will share our completed table setting! 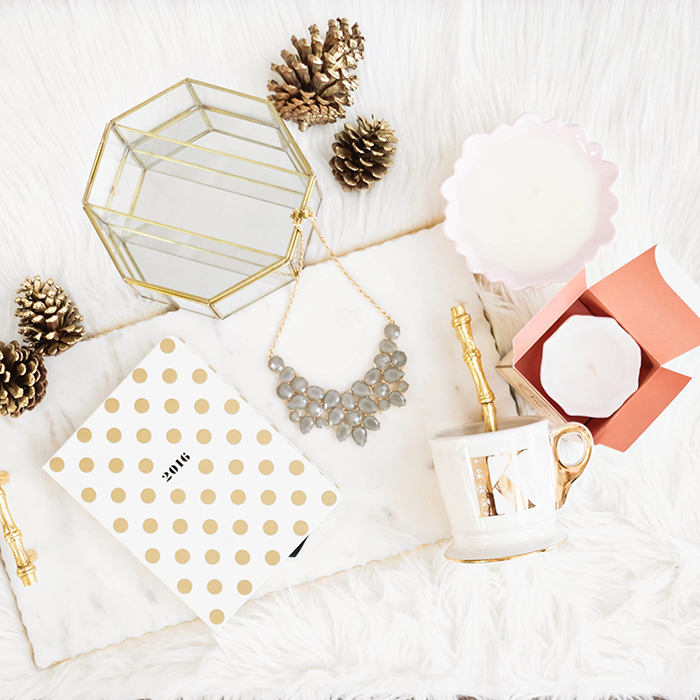 For last minute girly goodies, here are a few of my favorite gifts that you can find online or at any local mall/store. I am a little tempted to buy some or all of these myself, if I haven’t already =).